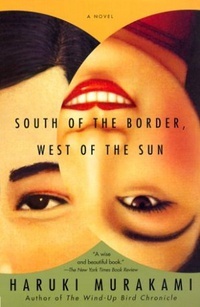 In South of the Border, West of the Sun, the simple arc of a man's life--with its attendant rhythms of success and disappointment--becomes the exquisite literary terrain of Haruki Murakami's most haunting work. Born in 1951 in an affluent Tokyo suburb, Hajime--beginning in Japanese--has arrived at middle age wanting for almost nothing. The postwar years have brought him a fine marriage, two daughters, and an enviable career as the proprietor of two jazz clubs. Yet a nagging sense of inauthenticity about his success threatens Hajime's happiness. And a boyhood memory of a wise, lonely girl named Shimamoto clouds his heart. When Shimamoto shows up one rainy night, now a breathtaking beauty with a secret from which she is unable to escape, the fault lines of doubt in Hajime's quotidian existence begin to give way. And the details of stolen moments past and present--a Nat King Cole melody, a face pressed against a window, a handful of ashes drifting downriver to the sea--threaten to undo him completely. Rich, mysterious, quietly dazzling, South of the Border, West of the Sun is Haruki Murakami's wisest and most compelling fiction.